Our firm's best practices include having clients complete a Florida Probate Intake form to have a Free Consultation* with one of our probate attorneys in Jacksonville. While we will still meet with you, you must complete the intake form for a Free Consultation*. Our lawyers want to give you the best probate advice or planning possible in an efficient and quick meeting. When potential probate clients call to make a consultation, we shorten the process by having the client fill out an initial Florida Probate Intake Form. This form is relatively easy to fill out and allows the estate planning attorneys to give important legal advice. The first pages of the intake form ask the client to provide some details about themselves and family members. On the first page, we ask some basic information about the client such as his or her name, address, and relationship to the decent. The decent is the person that has died, and his or her estate is now going through probate or administration. This same information is also needed about the decedent. Also, we ask the client to also provide the decedent’s date of birth as well as the decedent’s social security number. The next page asks for the client to provide information about the decedent’s Will. Please list the date of the Will and the name of the estate’s personal representative. Most beneficiaries will receive a Notice of Administration that should provide this information. Next, we ask clients to list any of the decedent’s children if there are any. If the child is a minor, or a person under the age of 18, list their date of birth on the form. We also request clients to record more information about the child such as his or her social security number and address. The client should also list the same information for any other beneficiaries to the decedent’s estate. The next step for the client is to tell the Jacksonville probate attorneys what assets the decedent owns. Starting on page 7 of the Probate Intake Form, the client can tell us what stocks and bonds the decedent owned. For each stock, list the name of the company and the type of security. We also need to know the name the stock is titled under, as well as its location, and value on the day the decedent died. On page 8 the client should list any bank accounts in the decedent’s estate. Write out the bank’s name, the account number, the name listed for the account, and the value of the account on the day the decedent died. We left ample space for multiple bank accounts if the decedent had more than one. On Page 9, please list the same information for any of the money market accounts or certificates of deposit in the estate. Page 10 is where the client should list the information regarding any U.S. Government Savings Bonds owned by the decedent. Besides the information recorded above, the client should also designate if the savings bond may be cashed, and if so, the name of the transferee. Further, list any mortgages and notes receivable in the decedent’s estate. List the mortgagor, the address for the mortgaged property, and the terms of the obligation. Just like the other assets, we also need to know the value of the mortgage on the day the decedent died. On the last few pages of the form, we ask about a few other assets a person commonly owns. List any insurance policies and annuities the decedent owned. Finally, list any vehicles in the decedent’s estate. We left a blank space for the client to list the miscellaneous property as well. The last page of the Probate Intake Form lists a few documents the clients should bring on their appointment. These documents are the: death certificate, the paid funeral bill, real estate deeds, vehicle titles, copies of any bills and creditors addresses, and the Will document itself. 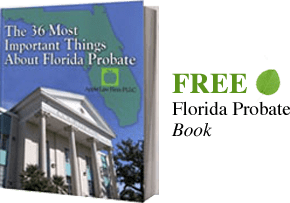 Download our Florida Probate Intake Form.